IT LOOKS like my tent pitching efforts a fortnight ago, have gone down well with one lady around here. I’m not sure whether it’s just that she wants some peace from me, but she’s spent several nights in it; apparently she loves listening to the dawn chorus. This week things have progressed from the tent, after noticing a local advert. 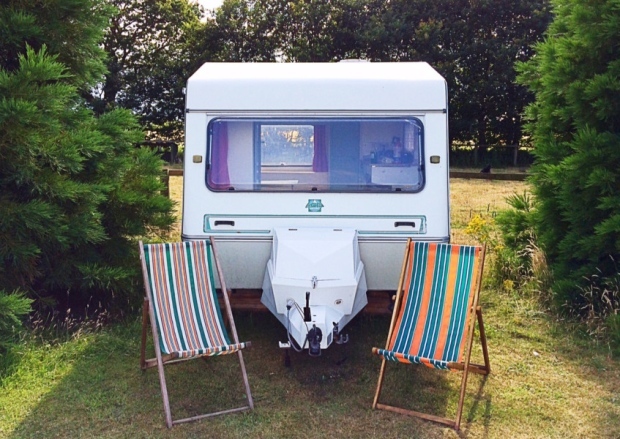 Maybe it was a moment of weakness, but we suddenly became all very spontaneous, which is so unlike us, and we jumped at the chance to buy our very own little caravan. So, with my brother in laws help, we brought the currently unnamed caravan back to the farm. Wendy has harped on for long enough about wanting a caravan to ‘do up’ and this would be the ideal chance for us to do just that. After all, we have such a lot of spare time these days, don’t we? As we pulled into the drive, she could hardly contain her excitement at the new arrival. Over the last few weeks I have noticed that a couple of the male lambs, who I believe had lost their bits back in April, were making romantic gestures towards the females in the flock. Bearing this in mind I have been mulling over moving out all of the ram lambs, (just because we know we aren’t the most efficient castrators around) and after Wendy’s threats of me having to sleep in the tent for good, if ‘Pip’ gets pregnant, I came to the conclusion that Sunday afternoon would be a good time to separate the suspects from their mothers and the rest of the sheep. My initial challenge was mustering up additional support from the women folk around here and as Wendy was busy I moved onto our daughters. As I moved down from oldest to youngest, Naomi, who is 16, could see that the opportunity was fast coming her way to help Dad out and on such a lovely day too. It was absolutely pouring down but still Naomi felt that putting her jacket over the top of her pyjamas was suitable attire for gathering sheep in the rain. Now, it was decided, the job was initially to pull out only a couple of ram lambs from the flock, so why would I assemble a pen in the field for such a minor task? That is a question I will never ask again, I’ll just crack on and get the pen made, regardless of how many sheep I need to separate. Things started off so well and we were able to catch ‘Rocky’, the oldest ram lamb without too much effort. “We’ll be sorted soon,” I said to Naomi, but unfortunately, I uttered those words several dozen times over the afternoon. After an hour of chasing, we resorted to my trusty lasso, which meant that we would still be running around a great deal, but we didn’t need to get so close before I launched the looping rope towards the lamb. I only wish that I had paid more attention whilst watching countless cowboy films over the years, so that I could use a lasso like Gene Autry or Audie Murphy. So many times that afternoon I wanted to throw in the towel, but with Wendy’s words of encouragement ringing in my ears, it sort of spurred me on. After almost two-and-a-half rain-soaked, fun-filled hours, we finished the job. Now there’s only a further six to move during the week, but you can be sure I’ll be constructing a field pen that day.